Cavieres, Lohengrin A. Sanhueza, Ana Karen Torres-Mellado, Gustavo and Casanova-Katny, Angélica 2018. Competition between native Antarctic vascular plants and invasive Poa annua changes with temperature and soil nitrogen availability. Biological Invasions, Vol. 20, Issue. 6, p. 1597. Williams, Laura K. Shaw, Justine D. Sindel, Brian M. Wilson, Susan C. and Kristiansen, Paul 2018. Longevity, growth and community ecology of invasive Poa annua across environmental gradients in the subantarctic. Basic and Applied Ecology, Vol. 29, Issue. , p. 20. Potocka, Marta and Krzemińska, Ewa 2018. Trichocera maculipennis (Diptera)—an invasive species in Maritime Antarctica. PeerJ, Vol. 6, Issue. , p. e5408. da Matta Agostini, Kamila da Costa Rodrigues, Luiz Antônio de Alencar, Alexandre Santos Mendonça, Cláudia Barbieri Ferreira and Gonçalves-Esteves, Vania 2017. Analysis of exotic pollen grains and spores from thawing lakes of King George Island, Antarctic Peninsula. Review of Palaeobotany and Palynology, Vol. 245, Issue. , p. 1. Lee, Jasmine R. Raymond, Ben Bracegirdle, Thomas J. Chadès, Iadine Fuller, Richard A. Shaw, Justine D. and Terauds, Aleks 2017. Climate change drives expansion of Antarctic ice-free habitat. Nature, Vol. 547, Issue. 7661, p. 49. Pertierra, Luis R. Aragón, Pedro Shaw, Justine D. Bergstrom, Dana M. Terauds, Aleks and Olalla-Tárraga, Miguel Ángel 2017. Global thermal niche models of two European grasses show high invasion risks in Antarctica. Global Change Biology, Vol. 23, Issue. 7, p. 2863. Galera, Halina Wódkiewicz, Maciej Czyż, Ewa Łapiński, Sławomir Kowalska, Maria Elżbieta Pasik, Mariusz Rajner, Marcin Bylina, Paweł and Chwedorzewska, Katarzyna J. 2017. First step to eradication of Poa annua L. from Point Thomas Oasis (King George Island, South Shetlands, Antarctica). Polar Biology, Vol. 40, Issue. 4, p. 939. Selbmann, Laura Onofri, Silvano Coleine, Claudia Buzzini, Pietro Canini, Fabiana and Zucconi, Laura 2017. Effect of environmental parameters on biodiversity of the fungal component in lithic Antarctic communities. Extremophiles, Vol. 21, Issue. 6, p. 1069. Domaciuk, Marcin Leszczuk, Agata Szczuka, Ewa Kellmann-Sopyła, Wioleta Koc, Justyna and Giełwanowska, Irena 2016. Female sporogenesis in the native Antarctic grass Deschampsia antarctica Desv.. Polish Polar Research, Vol. 37, Issue. 2, p. 289. Zucconi, Laura Onofri, Silvano Cecchini, Clarissa Isola, Daniela Ripa, Caterina Fenice, Massimiliano Madonna, Sergio Reboleiro-Rivas, Patricia and Selbmann, Laura 2016. Mapping the lithic colonization at the boundaries of life in Northern Victoria Land, Antarctica. Polar Biology, Vol. 39, Issue. 1, p. 91. Molina-Montenegro, Marco A. Galleguillos, Carolina Oses, Rómulo Acuña-Rodríguez, Ian S. Lavín, Paris Gallardo-Cerda, Jorge Torres-Díaz, Cristian Diez, Beatriz Pizarro, Gonzalo E. and Atala, Cristian 2016. Adaptive phenotypic plasticity and competitive ability deployed under a climate change scenario may promote the invasion of Poa annua in Antarctica. Biological Invasions, Vol. 18, Issue. 3, p. 603. Birkenmajer, K., Ochyra, R., Olsson, I.U. Stuchlik, L. 1985. Mid-Holocene radiocarbon-dated peat at Admirality Bay King George Island (South Shetlands, West Antarctica). 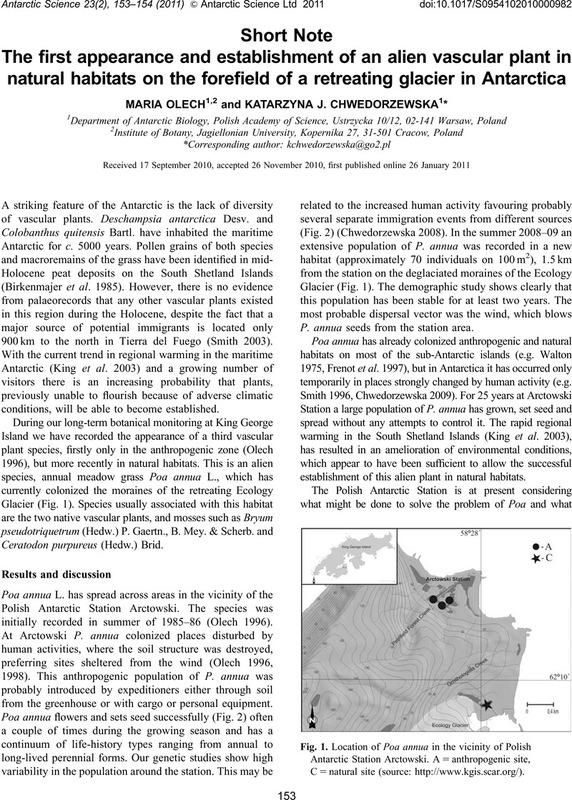 Bulletin of the Polish Academy of Sciences, 33, 7–12. Chwedorzewska, K.J. 2008. Poa annua L. in Antarctic - searching for the source of introduction. Polar Biology, 31, 263–268. Chwedorzewska, K.J. 2009. Terrestrial Antarctic ecosystems in the changing world - an overview. Polish Polar Research, 30, 263–273. Frenot, Y., Gloaguen, J.C. Trehen, P. 1997. Climate change in Kerguelen Islands and colonization of recently deglaciated areas by Poa kerguelensis and P. annua. In Battaglia, B., Valencia, J. & Walton, D.W.H., eds. Antarctic communities: species, structure and survival. Cambridge: Cambridge University Press, 358–366. Hughes, K.A. Convey, P. 2010. The protection of Antarctic terrestrial ecosystems from inter- and intra-continental transfer of non-indigenous species by human activities: a review of current systems and practices. Global Environmental Change, 20, 96–112. King, J.C., Turner, J., Marshall, G.J., Conolley, W.M. Lachlan-Cope, T.A. 2003. Antarctic Peninsula climate variability and its causes as revealed by analysis of instrumental records. Antarctic Research Series, 79, 17–30. Olech, M. 1998. Synantropization of the flora of Antarctica: an issue. In Faliński, J.B., Adamowski, W. & Jackowiak, B., eds. Synantropization of plant cover in new Polish research. Phytocoenosis 10, Supplementum Cartographiae Geobotanicae, 9, 269–273. Smith, R.I.L. 2003. The enigma of Colobanthus quitensis and Deschampsia antarctica in Antarctica. In Huiskes, A.H.L., Gieskes, W.W.C., Rozema, J., Schorno, R.M.L., van der Vies, S.M. & Wolff, W.J., eds. Antarctic biology in a global context. Leiden: Backhuys, 234–239. Walton, D.W.H. 1975. European weeds and other aline species in the sub-Antarctic. Weed Research, 15, 271–282.